Navaratri has started and everybody will be making different varieties of sundal every evening. My mom makes ellu urundai during navratri, especially on Saturday evening. 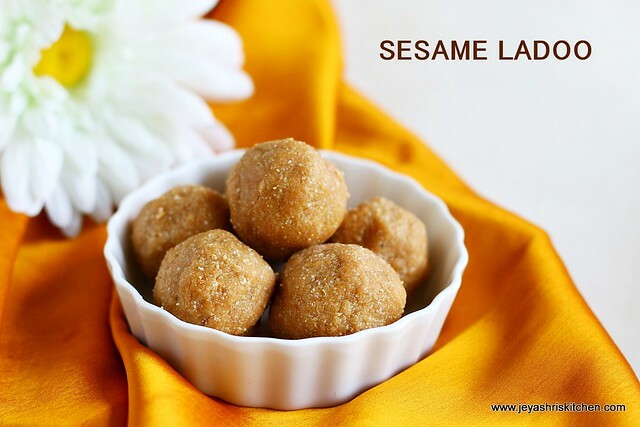 So here i am with Ellu urundai / sesame ladoo recipe.This this a simple one and can be made in a jiffy and doesn’t involve addition of ghee or oil. Roast the sesame seeds in a pan till it crackles. Take care not to burn this. Run this in a mixer coarsely. Add the jaggery to this and run it in the mixie into a fine powder. Transfer this to a plate and make it into a medium sized balls. The sesame seeds will leave oil while grinding, this will be helpful in grinding. This measurement yielded 6 balls . I used white sesame seeds. Black sesame seeds can also be used. Happy Navratri to you and your family.Another recipe which is tasty and your notes will help any of us to make it. thats perfect urundai...first click looks really beautiful! looks quiet easy and yumm!!! Perfect even i am going to make this today.. Happy Navarathri!!! do u keep golu at ur place.. do share pics.. even i hv started posting for navarthri .. 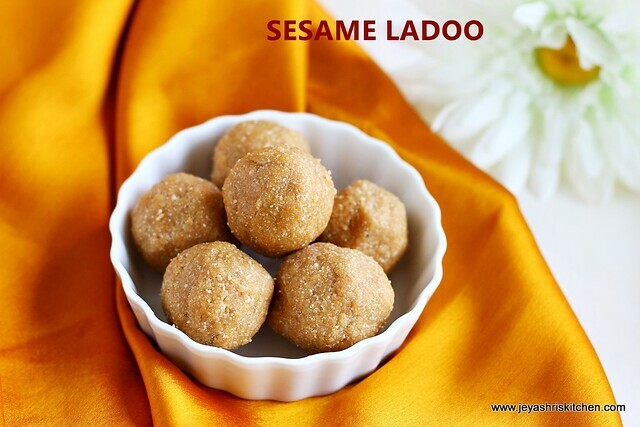 Nutty & delicious laddoos!!! Happy navaratri to you!! One of my favorites and happy navrathri to you. Happy navratri......laddos look so mouthwatering.....thanks for sharing. My husband loves this... but since I'm not a fan i hardly make it. This looks yummy, I never knew that it can be made by powdered seasme seeds. i've only had the one with whole seeds. I should give this a try. 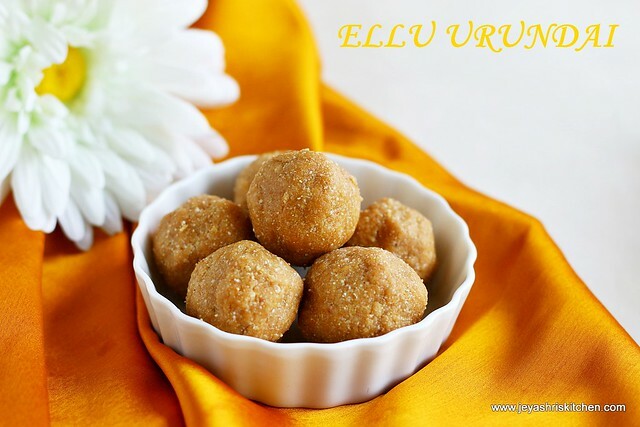 Happy Navaratri wishes Jeya, delicious ellu urundai,feel like grabbing some..
Calcium and Iron rich snack!! Happy Navratri to you and your family Jeyashri ~ the recipe sounds festive n super delicious! Happy Navratri to u n ur family, ellu urundai looks so delicious n yum..nice clicks..
Two year back I had them which was prepared my granny. They looks so yumm and delicious. One of my all time fav...made perfectly Jeyashri..the click looks beautiful. wow..looks so tempting...and perfectly doe...nice clicks too. This looks so delicious and divine Jaishree...yummy!